Who were the Imperial Guard? June 18, 2015 marks the 200th anniversary of the Battle of Waterloo. I've wrote about this battle and campaign extensively before: here, here and here. This coverage is rightly deserved, the Battle of Waterloo is one of the most important and celebrated battles in history for its finality in ending the career of Napoleon, and the century of peace it brought about for Europe (of course, this only works if we discount that whole imperialism and Crimean adventure). But there is so much written about Waterloo that I've decided to do something a little different. Today I'll talk about a pivotal actor in the battle, Napoleon's Imperial Guard. Whenever I think of the Imperial Guard, Star Wars and Emperor Palpatine comes to mind, but that is just my overactive imagination getting the better of me. The real Imperial Guard, perhaps what the movie's depiction is loosely based upon, began as the security force for the legislative and executive branches of the directory, the ruling power in revolutionary France at the time. When the directory was overthrown and Napoleon installed as consul, the guard did not object to the coup. They soon became Napoleon's personal guard. When it was constituted as the Imperial Guard in 1804, it numbered 8,000 men. 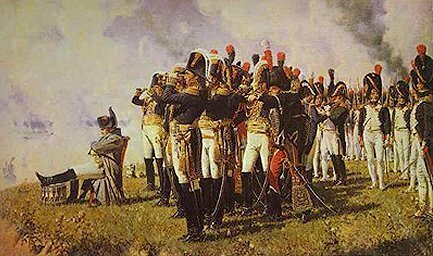 In 1812 as Napoleon began on his ill fated campaign in Russia, the guard numbered close to 100,000 and was a small army unto itself. It comprised its own General Staff, infantry, cavalry, artillery, engineers and a battalion of sailors (who were tasked with manning boats used by the emperor, as well as fighting as infantry, artillery and sappers). The guard was the cream of the crop. It was subdivided into three layers, the Young Guard, the Middle Guard, and the Old Guard. The Young Guard was the best of the annual intake of conscripts and volunteers, and while regarded as the lowest among the guard, were still better than a regular line infantry regiment. The Middle Guard was comprised of veterans of Napoleon's numerous campaigns in 1805 - 1809, while the Old Guard was composed entirely of seasoned veterans from Napoleon's earliest campaigns. They were handpicked, elite veteran soldiers whose loyalty was to Napoleon first. Men of the guard always outranked men of line infantry regiments, and they were provided with better pay, equipment and conditions. Men of the Old Guard were frequently known to complain to Napoleon, so much so that they became known as "Grumblers". The guard was referred to by the rest of the army as the "Immortals", which may be in reference to the elite soldiers of ancient Persia. When Napoleon went in exile in 1814, he bid his guard a "tearful farewell at Fountainebleau, complete with embracing of eagles [and] kissing of flags" (Andrew Roberts, Napoleon & Wellington, p. 118). The guard destroyed it's colours so that the royalists could not take them. A small cohort of the guard followed Napoleon into exile on Elba. Following his escape during the Hundred Days, the Guard was reconstituted and the regiments raised again. The guard would play a pivotal role at Waterloo. They were Napoleon's last reserves and we deployed in a final attempt to break Wellington's centre before the Prussians could fully engage. The attacked was mounted by the Middle Guard, with the fearsome Old Guard deployed to support. The Guard collided with Sir Colin Halket's Brigade (including our favourite regiment, Richard Sharpe's 33rd). The guard nearly broke these beleaguered battalions, who were marred from a long day of battle. A counter attack by the remnants of the Prince of Orange's corps was thrown back and the centre was about to break, if not for the arrival of a relatively fresh Dutch division. The guard was checked and forced to wheel, right into the face of 1,500 hidden British Foot Guards who had been lying down to avoid artillery fire. A point blank volley killed close to 300 men instantly, and the British pressed their advantage with a bayonet charge. The guard did something they had never done before, it retreated. Seeing the guard retreating broke all remaining French moral, and their army soon began retreating in disarray. The Allies commenced a general advance, which soon set upon the remaining battalions of the guard, who in relative order, were covering the retreating French. The Allies invited the guard to surrender, and were met with a call of: "The guard dies, it does not surrender". And die it did, with Marshal Ney stating: "There remained to us still four squares of the Old Guard to protect the retreat. These brave grenadiers, the choice of the army, forced successively to retire, yielded ground foot by foot, till, overwhelmed by numbers, they were almost entirely annihilated".